Being able to pinpoint the reason for a ranking drop is one of our most perennial and potentially frustrating tasks as SEOs. There are an unknowable number of factors that go into ranking these days, but luckily the methodology for diagnosing those fluctuations is readily at hand. 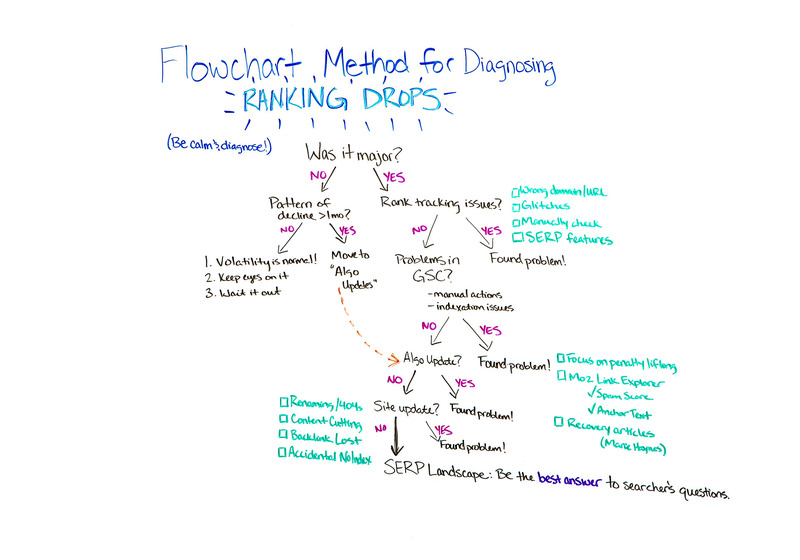 In today's Whiteboard Friday, we welcome the wonderful Kameron Jenkins to show us a structured way to diagnose ranking drops using a flowchart method and critical thinking. Hey, everyone. Welcome to this week's edition of Whiteboard Friday. My name is Kameron Jenkins. I am the new SEO Wordsmith here at Moz, and I'm so excited to be here. Before this, I worked at an agency for about six and a half years. I worked in the SEO department, and really a common thing we encountered was a client's rankings dropped. What do we do? This flowchart was kind of built out of that mentality of we need a logical workflow to be able to diagnose exactly what happened so we can make really pointed recommendations for how to fix it, how to get our client's rankings back. So let's dive right in. It's going to be a flowchart, so it's a little nonlinear, but hopefully this makes sense and helps you work smarter rather than harder. The first question I'd want to ask is: Was their rankings drop major? By major, I would say that's something like page 1 to page 5 overnight. Minor would be something like it just fell a couple positions, like position 3 to position 5. We're going to take this path first. It was minor. That's not a magic number. A month is something that you can use as a benchmark. But if there's been a steady decline and it's been one week it's position 3 and then it's position 5 and then position 7, and it just keeps dropping over time, I would consider that a pattern of decline. Volatility is normal, especially if you're at the bottom of page 1, maybe page 2 plus. There's going to be a lot more shifting of the search results in those positions. So volatility is normal. Keep your eyes on it, though. It's really good to just take note of it like, "Hey, we dropped. Okay, I'm going to check that again next week and see if it continues to drop, then maybe we'll take action." Wait it out. At this point, I would just caution against making big website updates if it hasn't really been warranted yet. So volatility is normal. Expect that. Keep your finger on the pulse, but just wait it out at this point. If there has been a pattern of decline though, I'm going to have you jump to the algorithm update section. We're going to get there in a second. But for now, we're going to go take the major rankings drop path. Now, some of these are going seem pretty basic, like how would that ever happen, but believe me it happens every once in a while. So just before we make major updates to the website, I'd want to check the rank tracking. That can be something that happens a lot. A site maybe you change domains or maybe you move a page and that old page of that old domain is still listed in your ranking tracker. If that's the case, then the rank tracking tool doesn't know which URL to judge the rankings off of. So it's going to look like maybe you dropped to position 10 overnight from position 1, and that's like, whoa, that's a huge update. But it's actually just that you have the wrong URL in there. So just check that. If there's been a page update, a domain update, check to make sure that you've updated your rank tracker. So it's software, it can break. There are things that could cause it to be off for whatever reason. I don't know how common that is. It probably is totally dependent on which kind of software you use. But glitches do happen, so I would manually check your rankings. Go to incognito in Google and make sure you're logged out so it's not personalized. I would search the term that you're wanting to rank for and see where you're actually ranking. Google's Ad Preview tool. That one is really good too if you want to search where you're ranking locally so you can set your geolocation. You could do mobile versus desktop rankings. So it could be really good for things like that. Crosscheck with another tool, like Moz's tool for rank tracking. You can pop in your URLs, see where you're ranking, and cross-check that with your own tool. So back to this. Rank tracking issues. Yes, you found your problem. If it was just a rank tracking tool issue, that's actually great, because it means you don't have to make a lot of changes. Your rankings actually haven't dropped. But if that's not the issue, if there is no rank tracking issue that you can pinpoint, then I would move on to Google Search Console. Moz's Link Explorer. You can check your inbound links and see their spam score. You could look at things like anchor text to see if maybe the links pointing to your site are keyword stuffed. So you can use tools like that. But you have found your problem if there's a manual action in there. So focus on getting that penalty lifted. Before you move out of Search Console, though, I would check indexation issues as well. Maybe you don't have a manual penalty. But go to your index coverage report and you can see if anything you submitted in your sitemap is maybe experiencing issues. Maybe it's blocked by robots.txt, or maybe you accidentally no indexed it. You could probably see that in the index coverage report. Search Console, okay. So yes, you found your problem. No, you're going to move on to algorithm updates. Algorithm updates happen all the time. Google says that maybe one to two happen per day. Not all of those are going to be major. The major ones, though, are listed. They're documented in multiple different places. Moz has a really good list of algorithm updates over time. You can for sure reference that. There are going to be a lot of good ones. You can navigate to the exact year and month that your site experienced a rankings drop and see if it maybe correlates with any algorithm update. For example, say your site lost rankings in about January 2017. That's about the time that Google released its Intrusive Interstitials Update, and so I would look on my site, if that was the issue, and say, "Do I have intrusive interstitials? Is this something that's affecting my website?" If you can match up an algorithm update with the time that your rankings started to drop, you have direction. You found an issue. If you can't match it up to any algorithm updates, it's finally time to move on to site updates. What changes happened to your website recently? There are a lot of different things that could have happened to your website. Just keep in mind too that maybe you're not the only one who has access to your website. You're the SEO, but maybe tech support has access. Maybe even your paid ad manager has access. There are a lot of different people who could be making changes to the website. So just keep that in mind when you're looking into it. It's not just the changes that you made, but changes that anyone made could affect the website's ranking. Just look into all possible factors. A lot of different things, like I said, can influence your site's rankings. A lot of things can inadvertently happen that you can pinpoint and say, "Oh, that's definitely the cause." There was one situation where a client had a blog. They had hundreds of really good blog posts. They were all ranking for nice, long tail terms. A client emailed into tech support to change the name of the blog. Unfortunately, all of the posts lived under the blog, and when he did that, he didn't update it with a 301 redirect, so all of those pages, that were ranking really nicely, they started to fall out of the index. The rankings went with it. There's your problem. It was unfortunate, but at least we were able to diagnose what happened. Maybe you're working with a UX team, a design team, someone who is looking at the website from a visual, a user experience perspective. A lot of times in these situations they might take a page that's full of really good, valuable content and they might say, "Oh, this is too clunky. It's too bulky. It has too many words. So we're going to replace it with an image, or we're going to take some of the content out." When this happens, if the content was the thing that was making your page rank and you cut that, that's probably something that's going to affect your rankings negatively. By the way, if that's happening to you, Rand has a really good Whiteboard Friday on kind of how to marry user experience and SEO. You should definitely check that out if that's an issue for you. Another situation I was diagnosing a client and one of their backlinks dropped. It just so happened to be like the only thing that changed over this course of time. It was a really valuable backlink, and we found out that they just dropped it for whatever reason, and the client's rankings started to decline after that time. Things like Moz's tools, Link Explorer, you can go in there and see gained and lost backlinks over time. So I would check that out if maybe that might be an issue for you. Depending on what type of CMS you work with, it might be really, really easy to accidentally check No Index on this page. If you no index a really important page, Google takes it out of its index. That could happen. Your rankings could drop.So those are just some examples of things that can happen. Like I said, hundreds and hundreds of things could have been changed on your site, but it's just really important to try to pinpoint exactly what those changes were and if they coincided with when your rankings started to drop. So we got all the way to the bottom. If you're at the point where you've looked at all of the site updates and you still haven't found anything that would have caused a rankings drop, I would say finally look at the SERP landscape. Then make content better than that. To rank, so many people just think avoid being spammy and avoid having things broken on your site. But that's not SEO. That's really just helping you be able to compete. You have to have content that's the best answer to searchers' questions, and that's going to get you ranking. I hope that was helpful. This is a really good way to just kind of work through a ranking drop diagnosis. If you have methods, by the way, that work for you, I'd love to hear from you and see what worked for you in the past. Let me know, drop it in the comments below.